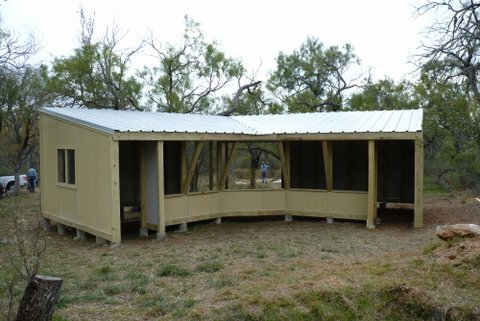 Many of the talented volunteers who will be building our bird blinds have been working hard at Inks Lake and the Fish Hatchery to finish up projects very similar to the ones we will build here at the nature center. We thought you might be interested to see what the structures will look like. View side of the bird blind. One similar to this one will be placed at the far end of the lake, nestled in the oaks, with the windows facing the water. We have already placed one of the bluebird houses in the area, and will be hanging an automatic feeder. New homes are ready for our bluebird friends!